Why Your HSA Can Be a Great Tax Tool. It is safe to say no one likes taxes, and one of the most common questions we get is, “Chad, what are some good ways to help with my tax bill?” Our first compliant answer, in a robotic voice, is “We are not accountants and do not provide tax advice. Please contact your CPA or accountant.” Okay, now that we have that robot out of the way, we usually say a Health Savings Account (HSA) is a great tool and underutilized. So let’s walk through the basics of an HSA, and then a few unique strategies to use them. 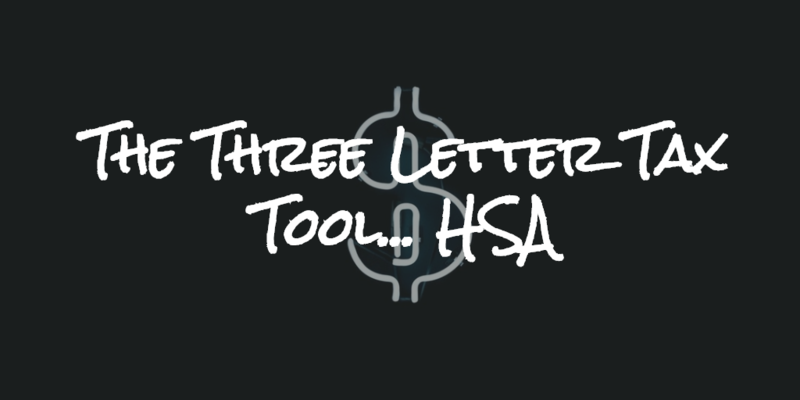 I like to call the HSA one of the most powerful tools in financial planning that you are most likely not using. Particularly as your federal tax bracket increases (looking at you, high-income earners). If a high-deductible health plan (HDHP) does fit your needs and your family, then you have the opportunity to utilize an HSA. Health Savings Accounts = TRIPLE tax benefit! That’s right not 1, not 2, but 3! If you look at your 1040, line 25 “health savings account deduction.” An above the line deduction lowers your adjusted gross income, which is why they are the preferred deductions. Not all HDHPs are HSAs, so make sure you confirm this with your employer or insurance provider. That is all the basic stuff. Also, when your employer sends you the benefits booklet, that you never read and assume nothing has changed, look up the HSA details. It is not uncommon for your employer to contribute to your HSA if you do go with a high deductible plan. They are happy to provide the extra incentive since you will save them money as well by utilizing a HDHP. Let’s look at a few ways to utilize the money in your HSA. The traditional usage of a health savings account is to save to your HSA, and then use the funds when medical expenses occur. This is a great strategy and allows you to utilize the benefits of an HSA. However, there are some other ways to take advantage of this powerful tool. The HSA requires the expenses to be for medical costs, but did you know the medical expenses can be from previous medical bills? A strategy to use is to build your HSA, and when medical costs occur pay them out of pocket to allow your HSA to accumulate. Here is the kicker, save those past receipts because if you have an emergency in the future (any emergency, not just medical), you will be able to pull money from your HSA without penalty since you have your old medical receipts. If you do have current medical costs, and the HSA are the only funds you have available then go ahead and use your HSA. This only works if you have additional funds to pay the current cost out of pocket. The downside to this is there is no inflation protection. Those receipts will lose their purchasing power over time, but I don’t see you saving receipts for 20 years and then using them. This is an emergency fund, hopefully, it never needs to be touched, but with this strategy you could keep access to a portion of your funds. The best part is that you can reimburse yourself for medical expenses in ANY year, as long as you have the receipt and you had as HSA open in the year of the expense. You can’t double dip, meaning in the above scenario, if you took a tax deduction for the medical expenses you can’t try to use that same expense to pull from your HSA in the future. This is rather difficult to do since your medical costs need to exceed 2% of your AGI, and you also need to itemize your deductions for you to be able to deduct medical expenses. Someone dubbed this the “Stealth IRA,” and I think it is a pretty awesome name, so I am using it here as well. This strategy works by making contributions to your HSA but have no intention of withdrawing the funds until age 65 or later. Why 65? Well after age 65 you can take penalty-free distributions for ANY reason. So if you want to pull money out to buy that Porsche finally, you can pay for it from your HSA penalty-free. However, you will have income taxes still. Same rule as an IRA, see why we like that name? If you want penalty-free AND tax-free after age 65, you will still need to use qualified medical expenses. The income tax is not a bad thing considering this had given you all the features of an IRA the entire time, tax deduction going in and tax deferred growth throughout. Another cool feature is that most HSA custodians now provide investment options as well. Your ultimate goal would be to get additional compounding growth if you were to use internal investments. Keep in mind, this can also go the other way. Markets can go down, and they will go down, so make sure you keep a certain amount of your HSA in cash if there is any chance of needing those funds. You don’t want to have to make health decisions based on your HSA balance and the stock market. This is also a great way to save for future medical costs and even a way to build up a long-term care insurance “bucket.” I am almost certain it won’t be hard to find uses for a large HSA balance in retirement. Each state has their own rules for the deductibility of HSA contributions. The keystone state (Pennsylvania) is on the good list! As of 2016, three states (Alabama, California, New Jersey) do not recognize HSAs and do not allow deductions of HSA contributions for state income tax purposes. If your state does not have state income taxes, then we don’t need to worry about this! We won’t get into the details of local taxes but this is something worth checking on. For example, New York City will exclude contributions to an HSA (NYC’s local tax can be as high as 3.876%). This is a good thing, this would mean NYC gives you a local tax deduction for your HSA contribution. However, Philadelphia will count HSA contributions in your income (Philly’s local tax can be as high as 3.9%). This is a bad thing, Philly will not give you a local tax deduction for your HSA contribution. Your goal should be to use these funds prior to death, or pass them to your spouse. You should have a beneficiary listed on your HSA, if that is your spouse, the transfer is tax free. If the beneficiary is not a spouse, it is a taxable transaction. However, you will be able to use the HSA to deduct any final qualified medical expenses. It is difficult to find medical expenses that don’t qualify for your HSA, but if you do happen to use funds for a non-qualified medical expenses before age 65 here is the downside. Distributions made for any other purpose are subject to income tax and a 20% penalty. Not ideal. After age 65, it would just be the income tax, if you don’t use for qualified medical expenses. In the end, the question of whether an HSA is right for you can’t be answered in a blog post. However, my goal of this post (and most of my posts) is to make you aware of some of these tools and start to ask better questions. The Health Savings Account (HSA) is a great tool to utilize if it fits your needs and family’s needs. Unfortunately, health care costs are probably not going down in the foreseeable future and having an extra bucket for these expenses, for now or later, will be something positive to have. For ANY tax and/or legal notes above, I am not an accountant/CPA or an attorney. Please be sure to consult an accountant/CPA or an attorney before implementing. This blog does not constitute tax advice or legal advice. Advisory Services and Financial Planning offered through Vicus Capital, Inc., a Federally Registered Investment Advisor. Registered Representative offering securities through Cetera Advisor Networks LLC, member FINRA/SIPC. Cetera is under separate ownership from any other named entity.